This impressive castle which dominates the village of Gorey on the eastern coast of Jersey was the main reason I chose to take a Channel Island tour last spring. I had watched Time Team’s episode, “Castles and Cannons” multiple times, and it was a place I longed to visit one day. When my tour group left Portsmouth by ferry, it took us 7 hours to reach the island of Guernsey; I had started reading a brick-sized biography of Queen Victoria the night before, and got as far the Crimean War during our voyage before we spotted land. We spent several days on Guernsey and visited nearby Sark before we took a second, much short ferry ride to St. Helier on Jersey. We didn’t get to the castle until our last day in the Channel Islands before we went on to France. Mont Orgueil Castle was built around 1200 by King John as an English stronghold after he had lost most of his land in France and the island became an outpost on the edge of his kingdom. The castle is set on a high, rocky outcrop facing the coast of Normandy, little more than 10 miles away. On a clear day, you can see France from the castle’s battlements. In John’s day, the castle was much smaller than it is today. 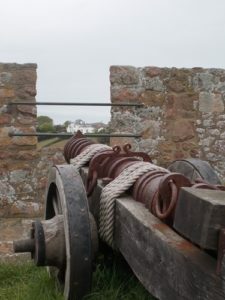 Its massive outer defenses, including the huge D-shaped Grand Battery, were added in the Tudor period or the Civil War–by which time Jersey’s main fortress had become Elizabeth Castle at St. Aubin’s Bay the other side of the island. The original medieval walls, which had withstood numerous sieges during the 13th century, were knocked down to build the current, higher walls. Time Team discovered the circular stone bases of old towers at intervals along the base of the existing 16th-century walls, and even one whole surviving tower buried beneath the lawn of the Grand Battery. The Time Team episode gives the impression that the advent of cannon made the castle vulnerable from the hill that rises behind it–hence the higher walls and heaviest defenses on the landward side–is a new idea. They demonstrated the effective range of arrows, muskets, and finally a theoretical cannon on the hillside (while firing off one of the real cannon from the battery). 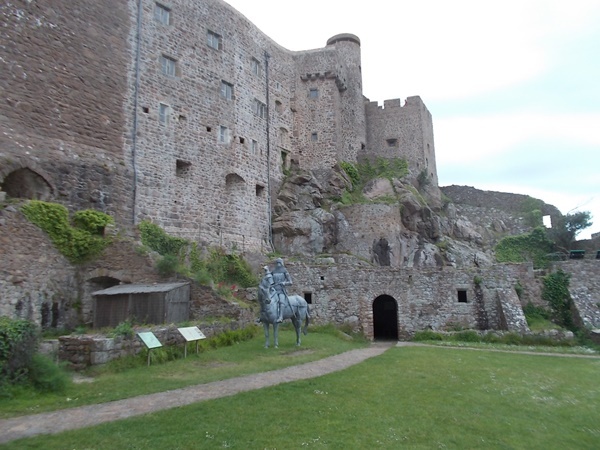 On Jersey, however, this theory seems to be the long-accepted traditional reason for abandoning Mont Orgueil Castle in favor of Elizabeth Castle+; the information available at both castles states it plainly. As you enter the castle, there are a number of information panels on the outer walls. One of these tells you about the Time Team dig. The ivy has grown back up around the base of the walls, but if you know where to look you can still spot the rounded foundations of the medieval towers. 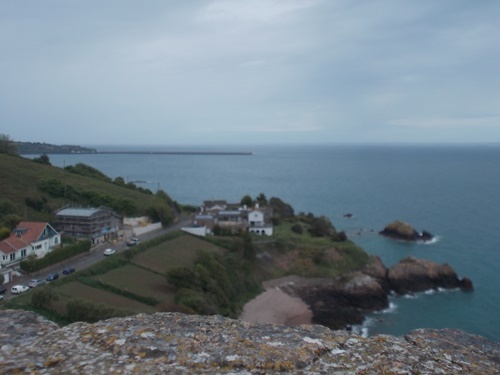 Much of the excavation of the outer walls occurred on the seaward side of the castle, however; castle visitors are usually kept away from the paths there, at the edge of the steep cliffs above the jagged rocks and the water. 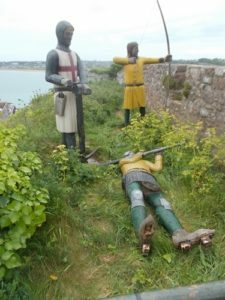 The Battery was also of special interest to me because of the medieval tower buried under it, but there is no visible sign of the tower’s existence beneath the green expanse of lawn spotted by little white flowers and manikin soldiers. The view is incredible, though. Inside the castle, where Time Team didn’t go, is a maze of vaulted rooms, corridors, and strange antechambers that can easily confuse the wandering visitor. Many of these are decorated with remarkable artwork. I saw at least 5 holographic portraits of Queen Elizabeth II, which made me uncertain if I’d already been through that particular room before. Other curiosities glimpsed around the castle interior included a more-than-life-sized medical model with multiple sample battle-inflicted wounds, a metal sculpture of a red griffon in flight within a cavernous gap between two inner walls, the rotating Dance of Death, and an ironwork family tree of Medieval Monarchy. We had a couple of hours at Mont Orgueil in the morning. 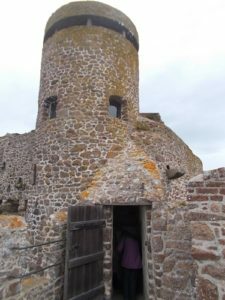 I would have liked to spend more time exploring the castle inside and out, but our tour guide had asked everyone to make their way down into Gorey in time for lunch. A steep path and walkway lead down from the castle yard into the back streets of the village. There is another, more chilling episode of Time Team filmed on Jersey, titled “Hitler’s Island Fortress,” about the excavation of a WWII German anti-aircraft battery built during the Nazi occupation of the Channel Islands. My tour group didn’t visit there; even though I’ve been around Jersey, I’m still not certain exactly where this is. But signs of the Occupation remain all over the islands. The uppermost parts of both Mont Orgueil Castle and Elizabeth Castle are topped with German watch towers. Wherever you go, you see other remnants from the war, from concrete bunkers to artillery emplacements netted with antique camouflage to tunnels that were dug out by the enslaved labor of prisoners of war. There are heart-rending memorials to these people too, many of whom were brought from Eastern Europe, and who died here.